Vivo launched the V15 in India on Friday last week. Just like the V15 Pro, the new V15 also comes with pop-up selfie camera on the front. The V15 is the fourth pop-up selfie camera phone to come to India in the last one year. It all started with Vivo Nex, followed by the V15 Pro, Oppo F11 Pro and now comes the V15. With the Vivo V15, the Chinese is aiming to compete with Oppo F11 Pro that was launched in India beginning this month. The V15 goes on pre-orders in India today and will be on sale starting April 1. The V15 was launched for Rs 23,990 in India. In comparison, the Oppo F1 Pro comes for Rs 24,990 in the country. Let’s take a look at everything that the two pop-up selfie camera phones bring to the consumer’s plate and which one is a better buy. Both the Vivo and Oppo phones come with gradient finish and look stunning. The V15 comes in three colour variants — Royal Blue, Frozen Black and Glamour Red. The Oppo F11 Pro comes in two colour variants including — Thunder Black and Aurora Green. Both the phones include no notch display, sport pop-up selfie camera, and slim bezels. The Vivo V15 sports a much bigger screen when compared to V15 Pro. The Vivo phone comes packed with an Ultra FullView 6.53 inch display coupled with a screen resolution of 1080×2340 and aspect ratio of 19.5:9. The phone also includes Corning Gorilla Glass 5 protection. The Oppo F11 Pro in comparison comes packed with 6.5-inch Full HD+ display. On the hardware front, the Vivo V15 is powered by MediaTek Helio P70 processor and similar to the case for the Oppo F11 Pro. Both the phones come in only one variant with 6GB RAM and 64GB storage model. Both the Vivo and Oppo phone supports expandable storage support. On the software front, the Vivo V11 runs on Funtouch OS 9 based on Android 9 Pie, while the Oppo F11 Pro runs on ColorOS 6.0 based on Android 9 Pie. For the battery, both the Oppo and Vivo phones come with 4000mAh battery. On the camera front, the Vivo V15 comes packed with three cameras on the rear panel and single on the front. The Oppo F11 in comparison includes two cameras on the back panel and single on the front. On the back panel, the V15 includes a 12MP + 8MP + 5MP configuration. 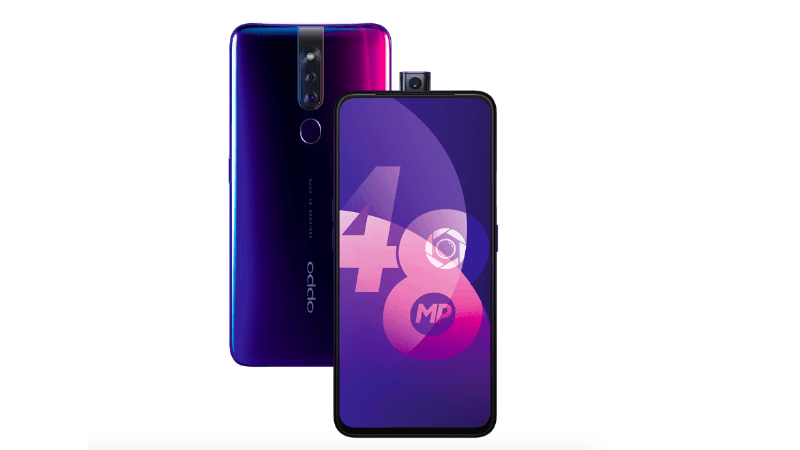 In comparison, the Oppo F11 Pro includes a primary sensor of a 48MP and secondary sensor of 5MP. The Oppo phone comes with Sony IMX586 sensor which is also present on the Xiaomi Redmi Note 7 Pro. On the front, the Oppo F11 Pro includes a 16MP selfie shooter while the Vivo V15 comes with a 32MP sensor similar to the V15 Pro.